First of all I must state that the Redwall series is by far one of my favorite series that I have read. That being said I must admit this is not one of my favorites out of the series. I did like this book don't get me wrong, but it was not the best of the series. Most of the time I am so amazed at how Jacques can incorporate so many different plots into one story and some how they all come together at the end. This happened in the story but I think that there was to many different plots that you really did not have highly defined main characters, and I felt kind of cheated by not getting to know all of the main characters more fully. Again I did still think it was a great book, but it lacked something for me. There are many plots to this book as I said before, so it might get a little confusing. To reduce that almost certain confusion I am going to put the many meanwhiles in bold. Let's begin, to start off with, in Mossflower Woods the creatures of Redwall Abbey are all getting ready for the Nameday Feast. Meanwhile at Salamandastron a young badger by the name of Mara is not happy there. There are to many rules for her which are made by her adoptive father Urthstripe the Strong. So she sets off with her friend Pikkle Ffolger (a rather glutinous hare) on a journey, along with their new found friend, Klitch the blue eyed weasel. Little did they know that he was the only son of the horrible Ferahgo the Assassin, and that they where being led right into a trap layed by the weasel's very father. Meanwhile back in Mossflower Woods, two vermin that deserted Ferahgo's hoard of corps makers, by the names of Dingeye and Thura find themselves at Redwall Abby's gates just in time for the Nameday feast. They beg to be let in and are eventually on one condition, they take a much needed bath. Meanwhile back near Salamandastron, Mara and Pikkle get away only to be misled by a begrudging lizard, into a band of cannibal toads. Meanwhile back at Salamandston Ferahgo and his army attack the mountain, but it holds strong, by Lord Urthstripe and his faithful hares. Meanwhile back at Redwall Abbey, during a storm the young squirrel Samkim and the young mole maid Arula happen upon the sword of Martin the Warrior. Meanwhile later that night the two vermin Dingeye and Thura are messing with a bow and arrow and accidentally shoot and kill Brother Hal. they seeing he is dead flee the Abbey but not without first taking the newly found sword of Martin the Warrior. When brother Hal is found, Samkim and Arula go out into Mossflower Wood to find the vermin, avenge Brother Hal, and return Martin's sword to its rightful home, Redwall Abbbey. Meanwhile back at Redwall Abbey most of its inhabitants have come down with Dryditch fever, and the only cure being the Flowers of Icetor from the Mountains of the North, a brave otter by the name of Thrugg and a baby doormouse by the name of Dumble set out to find them. I forewarned you there was a lot of plots and it was going to be VERY confusing. I did like this book it was just not my favorite. If you are already a Redwall fan and want to read the whole series be my guest and read this one also. 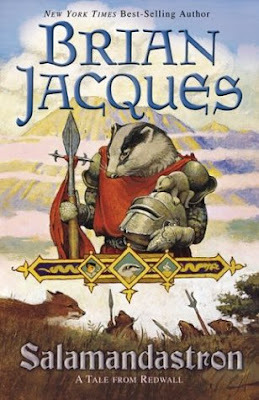 But if you are looking to start the Redwall series please do not start with this one, chose another, and once you are hooked you can read this one.